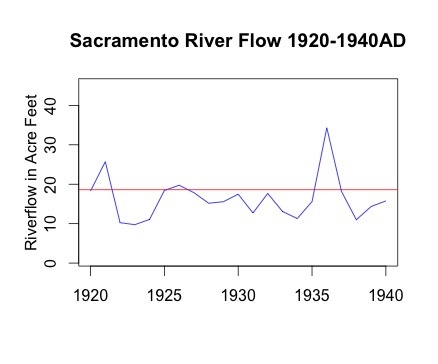 Below is plot for the Sacramento River, based on tree ring analysis of the precipitation that fell in the river basin. The plot covers years from 869 to 1977. The Green line is based on 30 year smoothing application. The red line is the average over the period. 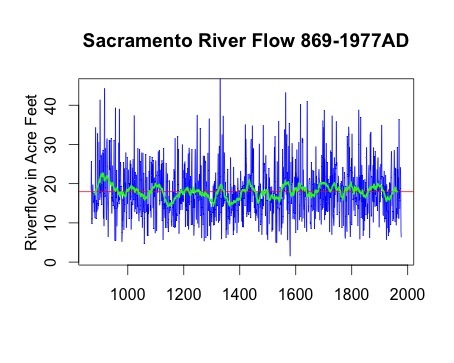 It is possible to see the sever droughts in the 1100s and 1300s, and the smaller drought during the 1930. This entry was posted in Climate, Climate Change, Drought, Weather. Bookmark the permalink. According to the CEO Friday Memo, the County is scheduling monthly Drought Planning meetings. These meetings will enable participating agencies to share information that will assist them in making future decisions that may impact the residents of Nevada County. In addition, Nevada County OES will create a website that will give the general public access to the most current Drought Planning information available from state agencies, local jurisdictions, and special districts. I will post more details when they come available. Russ, it appears the drought in the early 20’s was more long lasting. Those are the dangerous ones in our current situation. One year is one thing, 2-3 years is disaster. Cattle ranchers must be biting their nails and looking at herd reduction and high feed prices. See the update. I have graphed just the 1930s drought. Good work Russ. It would be interesting to know the severity and duration of the 1930’s drought. It appears from the graph that it endured for a number of years. I’ll do some checking on the web.